Andy Murray certainly enjoyed his new role at Wimbledon. The two-time champion made his debut as a BBC commentator for the quarterfinal between Rafael Nadal and Juan Martin del Potro, and was left feeling privileged to have witnessed the grueling five-set battle. Nadal came from a set down to win after 4 hours, 48 minutes and Murray – who had to pull out of this year’s tournament because of a lengthy injury layoff – was impressed. Viewers seemed to enjoy Murray’s expert insight as well. He and fellow commentator Tim Henman – a former Wimbledon semifinalist – joked about which of them the public would view as more boring. The BBC followed Murray’s advice and did an online poll to find out – with 65 percent saying Henman was the more boring. Jamie Murray remained on course for a second straight mixed doubles title at Wimbledon after he and Victoria Azarenka reached the quarterfinals. The duo beat Matwe Middelkoop of the Netherlands and Johanna Larsson of Sweden 7-6 (6), 6-3. Murray, younger brother of two-time singles champion Andy, won the title alongside Martina Hingis last year. Second-seeded Bruno Soares of Brazil and Ekaterina Makarova of Russia also beat Americans Sloane Stephens and Jack Sock 6-1, 7-5. Top-ranked Rafael Nadal outlasted Juan Martin del Potro in a crowd-pleasing five-set duel to reach his first Wimbledon semifinal since 2011. In a match filled with entertaining rallies between two of the biggest hitters in the game, Nadal came from a set down to win 7-5, 6-7 (7), 4-6, 6-4, 6-4 in 4 hours, 48 minutes – the longest match of this year’s tournament. Del Potro finished with 77 winners to Nadal’s 67 but failed to convert any of his five break points in the fifth set. Instead it was the Spaniard who earned the only break of the decider and he closed out the win on his first match point – leaving the fifth-seeded Argentine sprawled on the grass in exhaustion. Nadal will face Novak Djokovic next in a rematch of the 2011 final, the last time the Spaniard had even made the quarterfinals at the All England Club. John Isner has reached his first Grand Slam semifinal on his 41st appearance. The hard-serving American beat Milos Raonic of Canada 6-7 (5), 7-6 (7), 6-4, 6-3 to set up a meeting with Kevin Anderson of South Africa in Wimbledon’s last four. Isner’s 41 attempts to make a semifinal at a major is the second most in the 50-year professional era, behind Sam Querrey, who made the last four at Wimbledon last year with his 42nd try. Isner has yet to be broken at this year’s tournament and saved the only break point he faced on Wednesday. Raonic hit 31 aces to Isner’s 25 but was broken three times, including the last game of the match. Bethanie Mattek-Sands’ return to Wimbledon won’t get a perfect ending. Mattek-Sands and Lucie Safarova lost in the women’s doubles quarterfinals, ending their first tournament together since the American sustained a gruesome injury to her right knee at the All England Club a year ago. The top-seeded pair were also eliminated as Timea Babos and Kristina Mladenovic lost 7-6 (4), 6-3 to Abigail Spears and Alicja Rosolska. Having saved Federer’s only break point of a 90-minute fifth set at 3-4, Anderson took his first chance at 11-11 and then served out for victory. The 2017 U.S. Open runner-up triumphed in 4 hours and 14 minutes. Anderson hit 13 winners and just four unforced errors in the fourth set as he claimed the only break to force a decider. In his first Wimbledon semifinal, Anderson will face 2016 runner-up Milos Raonic or ninth-seeded John Isner. Eight-time champion Roger Federer and Kevin Anderson are locked at 10-10 in the fifth set of their Wimbledon quarterfinal. Federer has held the only break point of the set so far at 4-3. 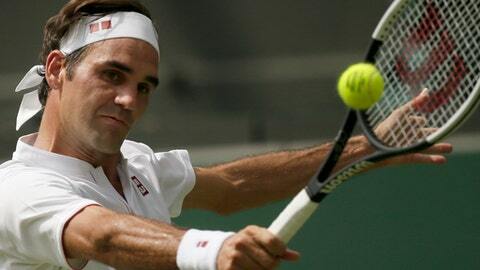 Eight-time champion Roger Federer has been taken to a fifth set by Kevin Anderson in the Wimbledon quarterfinals. The Swiss great won the first two sets and had a match point at 5-4 in the third, before Anderson hit back to level at 6-2, 7-6 (5), 5-7, 4-6. By winning the third set, eighth-seeded Anderson ended Federer’s winning streak of 34 consecutive sets at Wimbledon. That left Federer tied with his previous record, which was set between the third round in 2005 and the final in 2006. In the fourth set, Anderson hit 13 winners and just four unforced errors as the South African claimed the only break to force a decider. Federer has won his six previous five-set matches. His last five-set defeat was against Milos Raonic in the 2016 semifinals at Wimbledon. Novak Djokovic advanced to the last four at a Grand Slam for the first time since 2016 with a 6-3, 3-6, 6-2, 6-2 Wimbledon quarterfinal victory over Kei Nishikori. Three-time Wimbledon champion Djokovic maintained the dominance he has shown throughout the tournament on his first serve. The 24th-seeded Nishikori was able to attack Djokovic’s second serve and had a chance to take the lead when he was 0-40 up at 2-2 in the third set. Djokovic rallied to hold and only lost two more games from that point onward as he advanced to his first Grand Slam semifinal since the 2016 U.S. Open. Djokovic missed the second half of 2017 with an elbow injury, but his run at Wimbledon is the latest indicator that the 12-time Grand Slam champion is nearing his best form. He will next face either two-time champion Rafael Nadal or fifth-seeded Juan Martin del Potro. Roger Federer has failed to extend his own record for the longest streak of consecutive sets won at Wimbledon after dropping a set in his quarterfinal with Kevin Anderson. After Federer had taken a 6-2, 7-6 (5) lead, eighth-seeded Anderson won the third set 7-5. The first two sets took Federer’s streak to 34 – equaling the mark he set between the third round in 2005 and the 2006 final. Federer had a match point at 4-5 but failed to take it, before Anderson broke in the following game to earn the opportunity to serve out the set. Anderson then saved three break points in that game, before hitting an ace to convert his first set point. Roger Federer’s streak of service games without being broken at Wimbledon has ended at 85. Kevin Anderson became the first man to break Federer during the tournament at the start of the second set of their quarterfinal. Federer led 6-2, 0-2 following the break. The longest streak of service games won at the All England Club was Pete Sampras’s 118, set between the third round in 2000 and the second round in 2001. Defending champion Federer hadn’t been broken since the opening set of his 2017 semifinal victory over Tomas Berdych. Roger Federer has played his first Wimbledon point away from Centre Court since 2015. The eight-time champion’s quarterfinal with eighth-seeded Kevin Anderson is underway on No. 1 Court, after Federer was scheduled away from the All England Club’s main stadium for the first time since the same stage of the tournament three years ago. Three-time champion Novak Djokovic has opened proceedings on Centre Court against 24th-seeded Kei Nishikori. Two-time champion Rafael Nadal and fifth-seeded Juan Martin del Potro will follow, while 2016 runner-up Milos Raonic and Wimbledon last-eight debutant John Isner play second on No. 1 Court. Roger Federer, Rafael Nadal and Novak Djokovic headline the men’s quarterfinal lineup at Wimbledon on Wednesday as the trio bid to all reach the last four at the same Grand Slam for the first time since the 2012 French Open. Defending champion Federer will play in the unfamiliar surroundings of Wimbledon’s No. 1 Court as he takes on eighth-seeded Kevin Anderson. It is the first time since 2015 that the eight-time champion will play away from Centre Court. Having played three of his opening four matches away from Centre Court, three-time champion Djokovic’s request to have his quarterfinal with 24th-seeded Kei Nishikori played in the main stadium was granted. Two-time champion Nadal is through to the last eight at Wimbledon for the first time since 2011. He faces fifth-seeded Juan Martin del Potro, who has reached the last eight at consecutive Grand Slams for the first time since 2012. 2016 runner-up Milos Raonic faces ninth-seeded John Isner, who is playing in his first Wimbledon quarterfinal.